Package from MBK showed up in the mail this afternoon. Staging yard can begin this weekend if house work doesn't get in the way. Sounds like you have your priorities mixed up. After a very successful chase on the real thing today (thanks again for all the info), I'm now very excited to see this come together. You're welcome ! Glad to hear you were able to find some traffic. Can sometimes be elusive. Can't wait to see the results of your day. You working on a write up Ed K with your pics ? Yep. It's been a very busy week at work, so I'm only half way through. Hopefully I'll finish it up this weekend. Need to dust thing thing off. Over 2 months of inactivity got wiped away in a hurry this weekend. 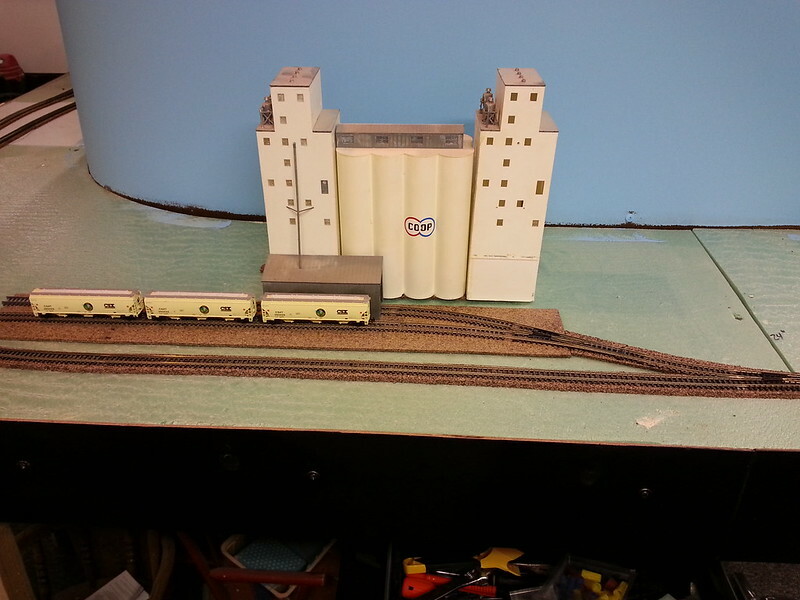 I posted photos in the Weekend Update of my MOW caboose I finished and some SD50-s that needed new numbers. That was enough to get me motivated to get back to completing at least the mainline on the Hanover Sub. Also a trip to the LHS and being told that if I want to be on the open house tour, I need to let them know but August 1. 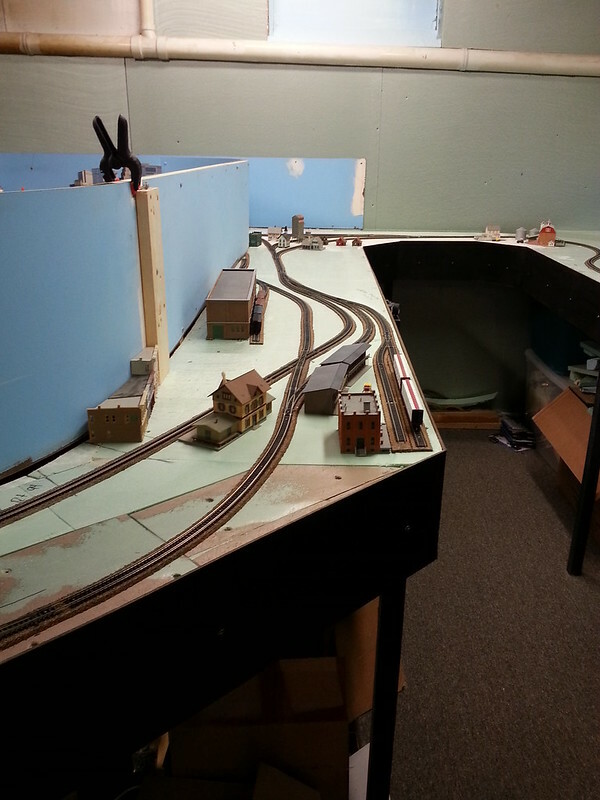 I have temporarily laid all the cork and trackwork to complete the mainline and ran a test train of a locomotive and 10 cars around the layout. Ran train for about 20 minutes in each direction and only one switch was picked, I'd say that's a pretty good day. I'm still working on acquiring some more turnouts that I will have to cut in later, but at least now I can run trains while I'm working on other things. I'm a fan, and love seeing progress. However, might I recommend Peco turnouts if the funds can be procured? They're not perfect either by a long shot, but the internal spring alone makes them worthwhile. I think they're also more reliable than the few Atlas "Custom Line" code 80 turnouts I've used. No switch motors needed. Dave, I wasn't going to change my turnouts, but that may have changed now. I added a right and a left peco insulfrog to my last order at BLW to check them out. I got the mediums thinking they were like the bigger Atlas custom lines, but apparently I'm not up on my turnout sizes, as they are the smaller Atlas one. Regardless, I think as I acquire funds, they will be getting replaced with the Pecos. Very nice and like you said, no switch motors needed ! I was able to come up with a version of the center sprung but some work and some don't work so well. The track geometry on Peco Insulfrog switches are different from that on the Electrofrog, so you need to be careful on how you match up crossovers, yard ladder switches, etc. The Insulfrog switches exactly match the Atlas #4 Code 80's, but the Electrofrogs don't. The EFs are all the same frog size, just different lengths. I think the frog sizes change on the IFs (get shallower) as the length of the switch increases. Yes, I noticed that last night. I set one on top of the existing track and found out that way. Good thing is track is just spiked in place and not glued down. I installed the two I received from BLW into a spot where I was having problems entering the yard and they worked flawlessly. More Peco switches installed today. 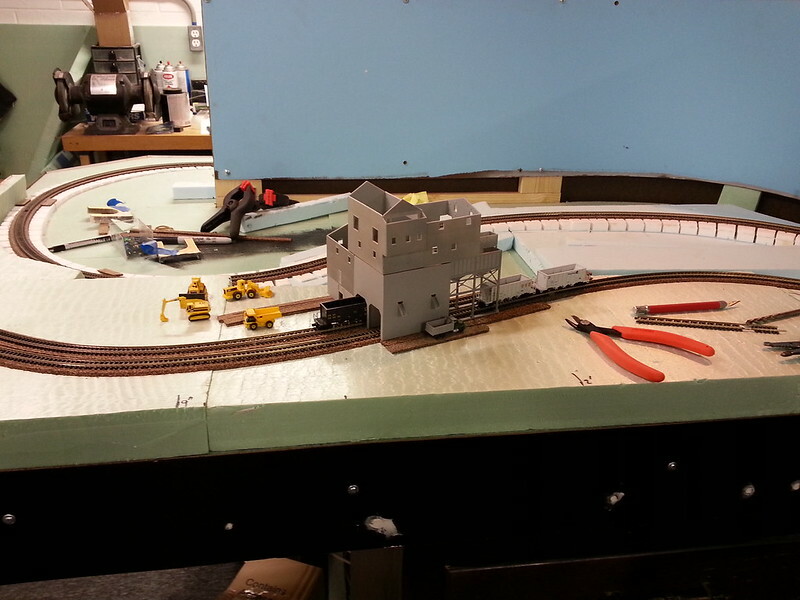 I replaced some switches in the yard ie entry/crossover switches from main to the yard tracks and cut in switch leading to Bittinger and one end of passing siding at Utz. These were electrofrogs so I had to drop a few more feeders to pick up the insulated sections of track but everything worked after I had tied everything back together. 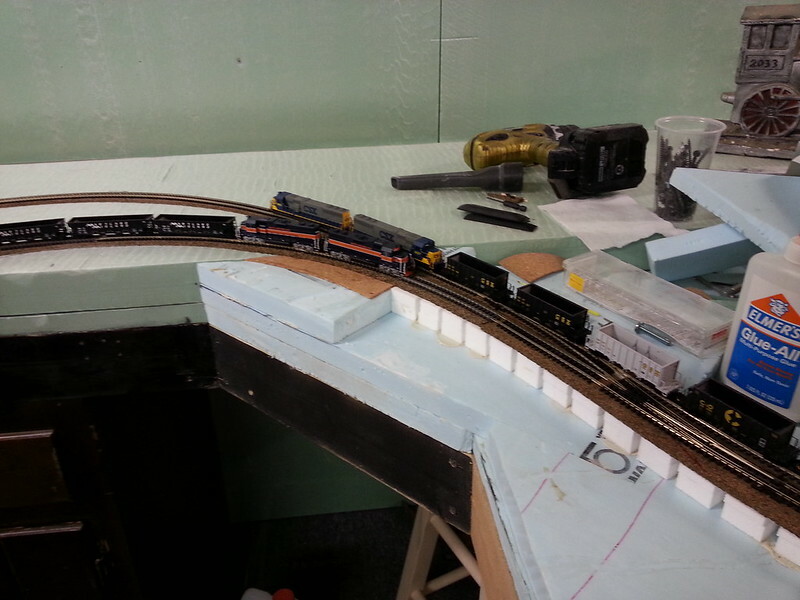 Layout had it's first official visitors today as Blazeman (Larry) and Bill stopped by, with aforementioned switches and a couple of Atlas B&O Sunburst GP30's to drop some decoders in. After some tinkering with one to get it running consistently, paired them up in a consist and they made a couple laps around the sub. They looked right at home, just wished I'd have taken a picture or two. B&O 6959 is now CSX 2208, while B&O 6962 was wrecked before the CSX merger, otherwise would have probably taken same path as 6959 and become part of the Road Slug fleet. Work has kicked up to a feverish pace as I try to get the layout up and running for an open house in September I plan to be part of. I got more Peco switches, so they were cut in place and all are working great. Still need about 20-25 more Now for the pictures !! We'll start in Hagerstown, MD yard. West end is at the top of photo, which heads into staging representing Cumberland, MD. East end is at the bottom, with the locomotive servicing area. D797 will originate here, which is Hagerstown to Hanover, switching eastbound locations. Due to compression of the layout, 797 will go to Baltimore catching two more industries which you'll see later. Also leaving from Hagerstown yard, will be a local to switch cement facility and Maryland Metals near Security. MM will be off-layout, so empty gondolas will be set off as shown and fulls picked up here. I plan on building a wooden trestle here per the prototype. First up on switching duties for D797 will be Ag Com. It is the second largest customer on the subdivision behind the quarry at Bittinger on the real sub. 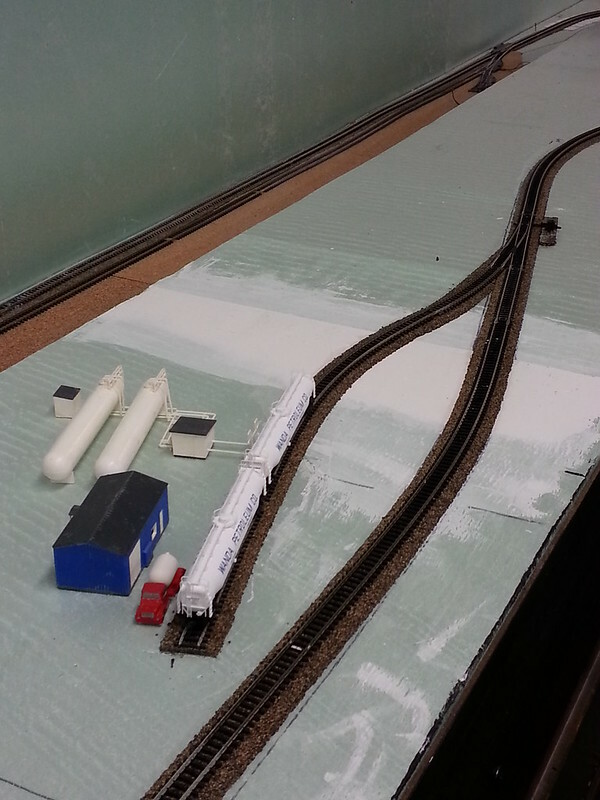 Here, I can get 8 cars at Ag Com, where as in real life the sidings hold 20 cars or more. Next will be Bittinger, 797 probably won't do anything here. This is where Q763/762 orginate/terminate, full rock runner out, empties back in. Around the corner, we come to where the Utz potato chip factory is. They receive tankers of cooking oil. This will be switched by westbound D795. There is also a passing/storage siding here. Also in front of Utz is a small hopper yard for the mine. As we continue west, we now arrive in Hanover. This is where the home terminal is for the prototype. 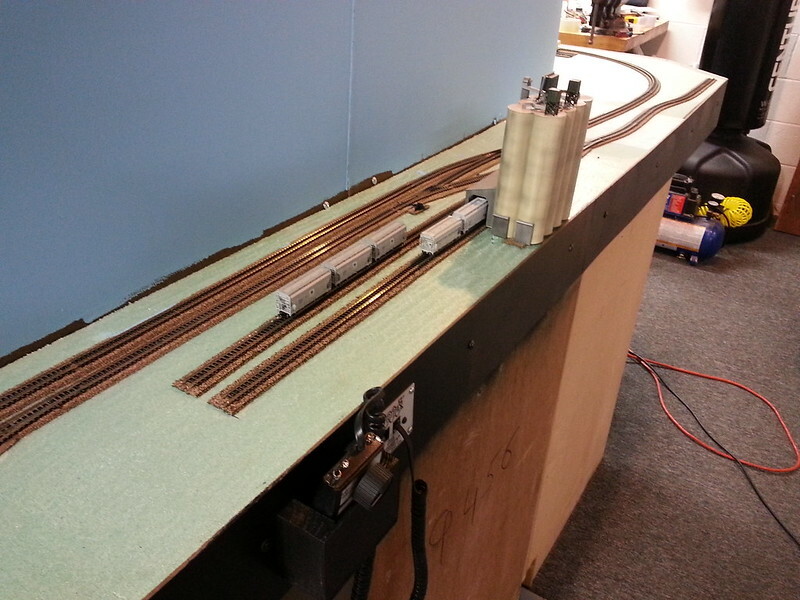 Due to space constraints and wanting to have more switching available in Hanover, we decided to leave it out. Here, CSX crosses the ex Maryland and Pennsylvania at grade with a switch to drop cars off for Yorkrail (now a Genessee and Wyoming company) to switch out industries. Sunoco Plastics receives hoppers of plastic pellets. Crews will shove cars head first here. 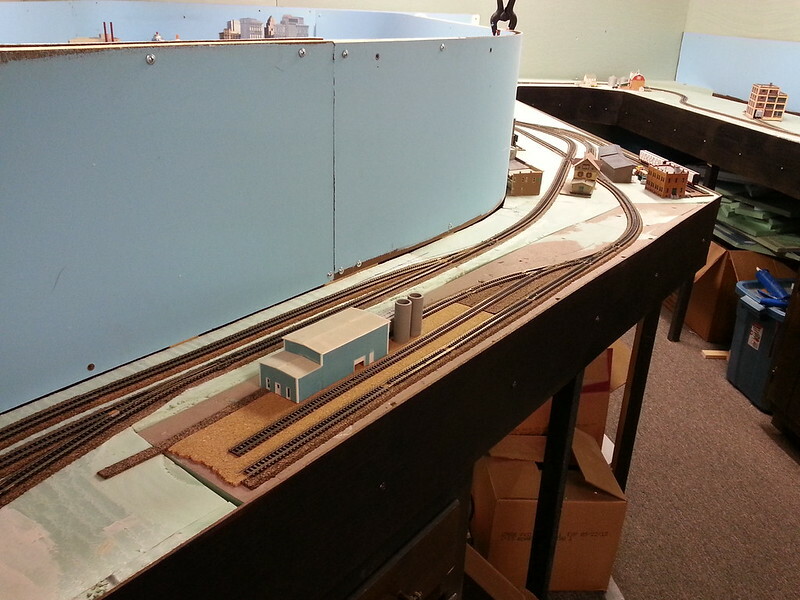 There is also a small two track yard to store cars at times. This line used to continue as the Frederick Secondary until it was abandoned. At one time, Maryland Midland did attempt to reopen the line but it was going to be too costly. It would work great now as MMID is now also a G&W company. 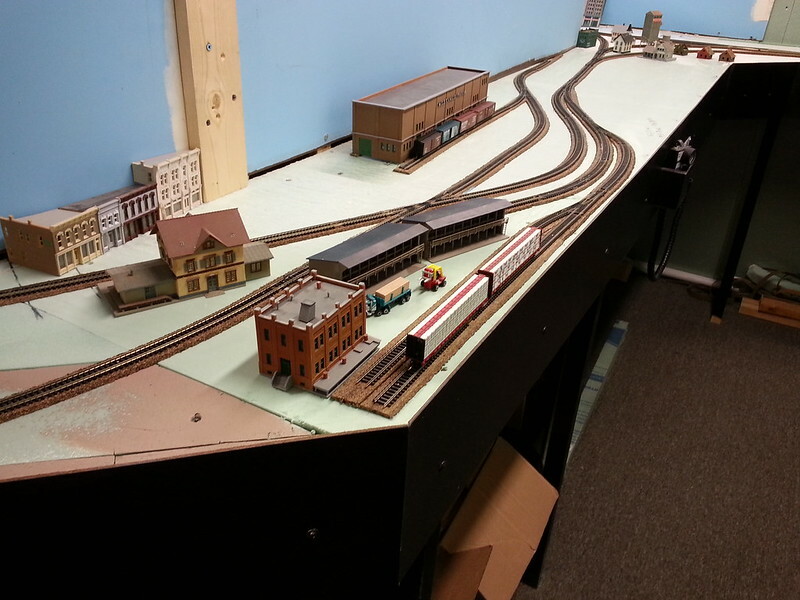 There is a lumber company in Hanover, Schmuck Lumber, which is not served by rail on the prototype. I needed a place to drop my centerbeams so in my world, they go to Schmucks. In the distance is Westvapco Paper. 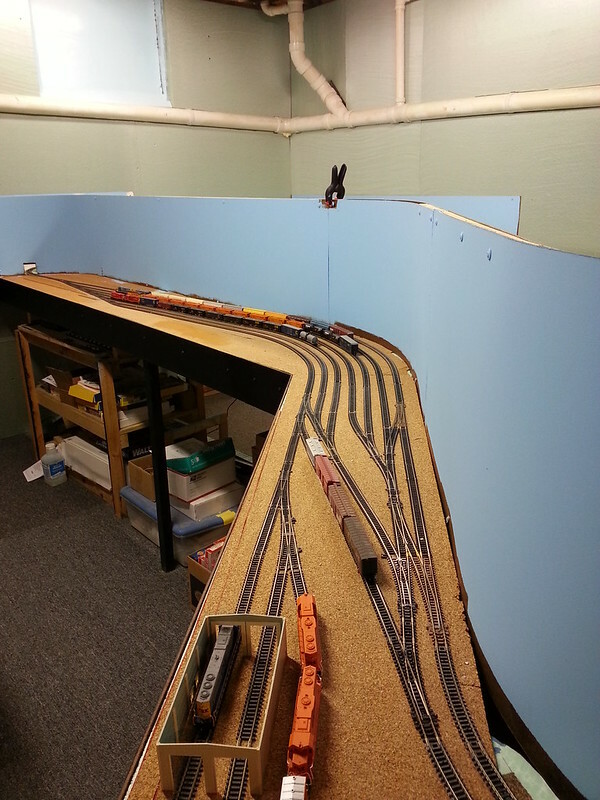 This too is an add-on for my layout. 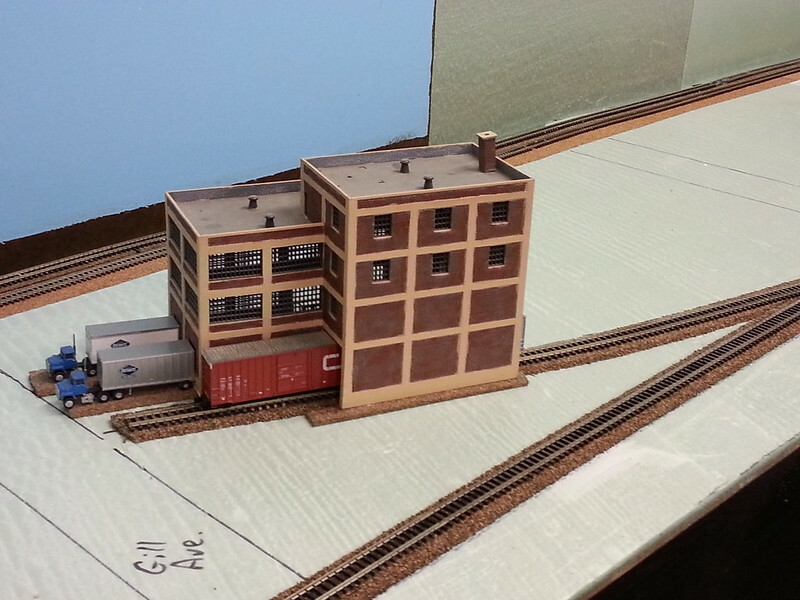 This building is from Lee Weldon's (wm3798) layout and it gives me another switching op. Here again is Porters Sideling. 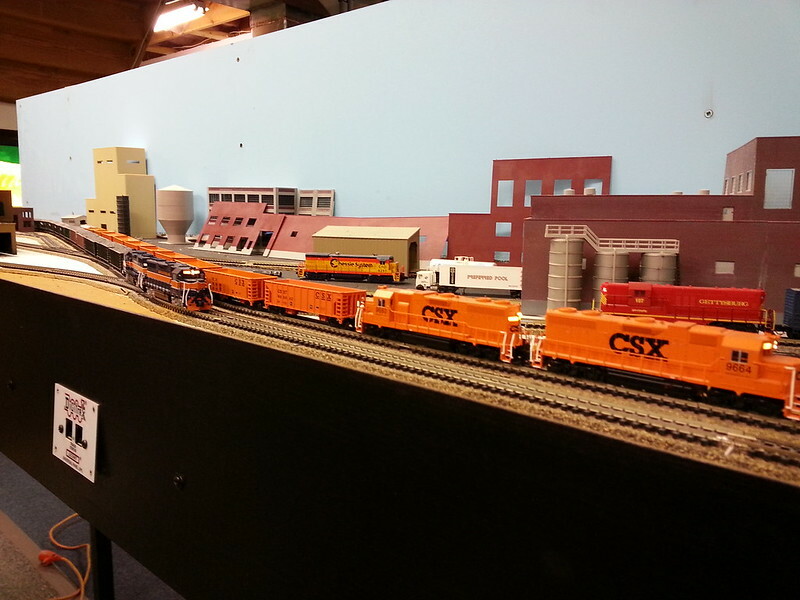 This is an interchange between CSX and YorkRail. Westbound is left, eastbound is right, and YorkRail heads up around the scene break. The YorkRail line goes to Spring Grove, home of PH Gladfelter paper mill, and then to York. Cars will be left at PS for the mill. Next is two industries near Hampstead, MD. The first is another add-on as there is no switching in Hampstead. There is an old station along the main with evidence that there used to be a spur there. I have added a printing company. Also here, is Suburban Propane. 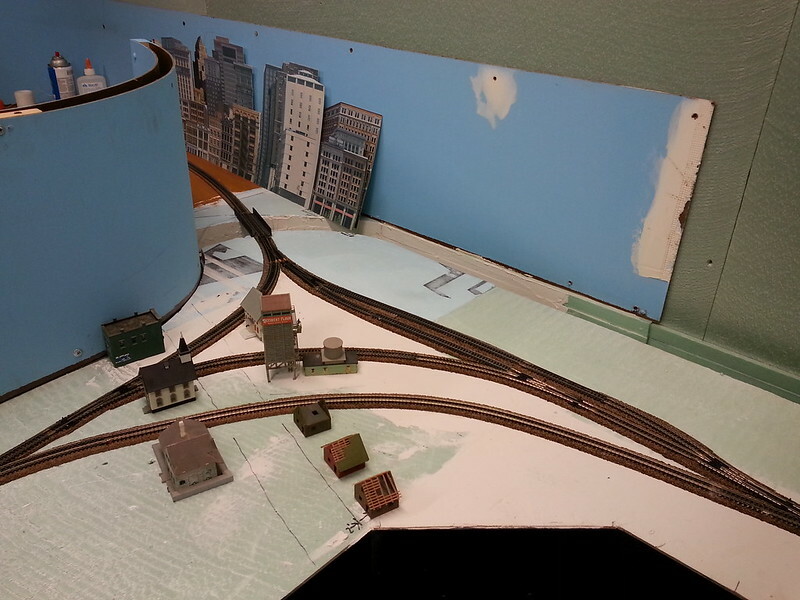 Finally before heading downhill into other end of staging, representing Baltimore, is the interchange with MMID. Here, the Union Bridge-Emory Grove turn waits as the Q762, CSX empty Rock Runner heads back home.